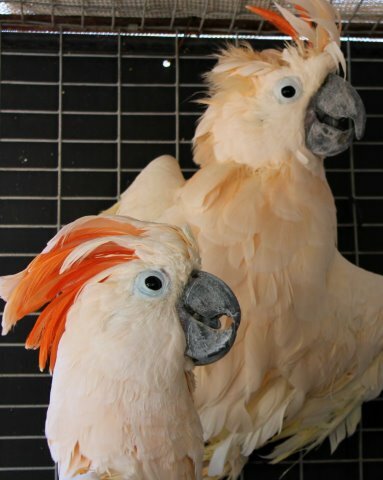 Andreas & Snowey are two Moluccan Cockatoo boys that we highlighted in our September 2014 fundraising letter. In his early years Andreas was a robust and beautiful Cockatoo. As his family’s life changed he was relegated to a life of neglect. Andreas came to The Oasis in 1997 and he proved to be dominant and assertive. He loved to chew anything his beak could grab. He chewed so hard we had to design a stainless steel cage for him. In short, Andreas was just a magnificent bird. Andreas spent some time in the Male Cockatoo Aviary at The Oasis. As tempers flared in the free-flight aviary, Andreas became a casualty of a significant bite to his beak. The bite was so hard that it permanently dislocated the left side of Andreas’s jaw and penetrated to germinal tissue in his beak. It was at that time of intensive veterinary care that we found Andreas had progressive bone deterioration in his left hip socket. As our last letter described, Andreas underwent left leg amputation because of the degenerative bone loss. Snowey fell on hard times decades ago when he was illegally smuggled into the USA. An illegal shipment of parrots stuffed into mailing tubes was intercepted at the U.S. border and the parrots found were rescued and put up for sale by the government agency. By accident, Snowey’s mailing tube was overlooked and he remain stuffed in the tube lying on his left side until, upon discovery that he was alive, he had lost the use of most of the left side of his body. His left eye had to be removed and also the toes of his left foot. The trauma of the event scarred not only Snowey’s body, but his mind and behavior, too. Who could blame this Cockatoo for being frightened of people? I cannot imagine the horrors Snowey experienced during that ordeal. Efforts were made by well-intentioned people to give Snowey a good life. He was sold to go into a domestic breeding program. Then he went to a woman who tried to make a companion of him. Finally, in 1999, Snowey came to The Oasis Sanctuary. We tried a variety of housing options for this frightened fellow. By 2008 Snowey’s physical limitations paid a toll to the point that we felt he needed some special attention. That is when Snowey came to foster care with Tom & Ruth Ann La Rue. Snowey’s quality of life revolves around Andreas now and the same is true for Andreas’s dependence on Snowey. The pair spends their days and nights moving freely around their elevated indoor/outdoor enclosure. Although neither can fly nor even walk well, they rely on each other and the wire borders of the cage to maneuver about. We commonly find the two snuggling with each other as if they are exchanging their past secret lives. They eat well and are very interested in the activities around them. They have plentiful toys anchored to the sides of their enclosures so that they can do what Cockatoos do best – chew. If anyone tried to question “quality of life” with these parrots, there would be two Cockatoo Boys to place a very strong argument that LIFE IS GOOD. Editor’s Note: Snowey crossed the Rainbow Bridge on December 21st, 2014, just months after this article was written. Snowey is truly missed by his friend Andreas, and all who knew him.